Chess Table With Chessmen: "A Work In Progress"
This Chess Table and Chess set is "A Work in Progress,'' as it is designed exclusively for a close friend and fellow "woodworker!" The friend and woodworker has spent a career in both the woods and metals industries, plying his trade with skill & precision. His skills are employed to keep the equipment for The Plane Edge, LLC, working flawlessly. Not wanting to accept financial remuneration for services rendered, the Chess Table and Chess Set will be payment indeed! The playing surface of the chess top is made from alternating pieces of wenge and tiger maple. 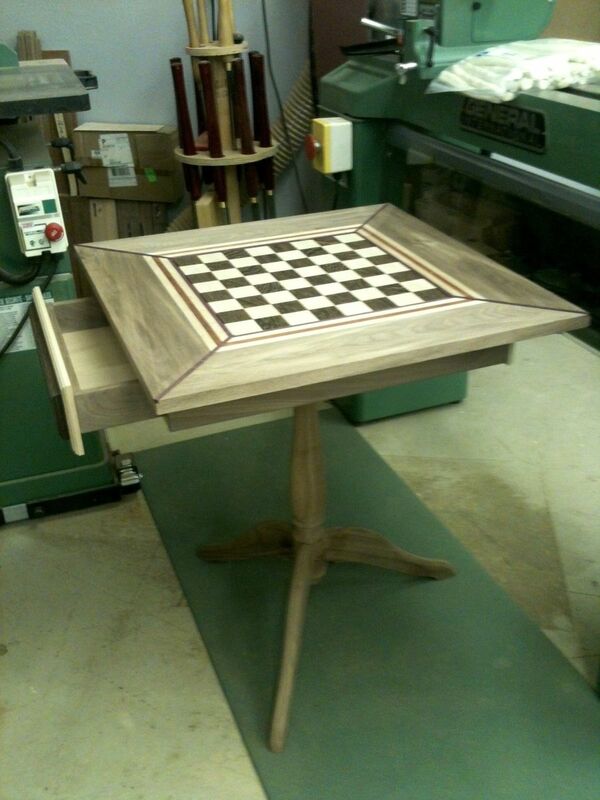 The checkerboard pattern is surrounded by an inlay of bloodwood and maple, topped off with a wide walnut border. The corner miters of the chess table are also inlaid with bloodwood, to provide a very stricting visual display of natural wood color. 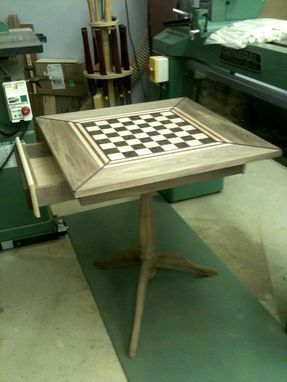 The base of the Chess Table is a turned walnut spindle, made from a single piece of 3" walnut. Three (3) curved legs are attached and equally spaced around the turned spindle with 1/2" dowels. The Chess Sets as still to be completed, but they are designed to commemorate/honor the precision skills of the woodworker. One set of chess pieces will be made entirely of brass hardware pieces, while the other opposing set will be made of steel hardware pieces. For example, the King and Queen of each set will have either a wenge or tiger maple body, topped off with a large wing nut, to represent the crowns of the pieces. Other chess pieces will have appropriate hardware to complement them. The Chess Table and Chess Set will be given several coats of a mix of Danish wood oil/polyurethane, hand-rubbed to a satin sheen, and waxed to a smooth, silky feel. 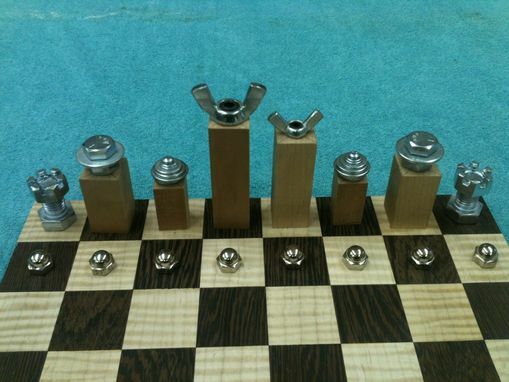 Both Chess Sets will have felt pads glued to the bottoms to help avoid scatches to the chess playing surface. Finally, two (2) drawers will store the Chess Sets in compartmentalized sections lined with a deep burgundy velvet.